The past two decades have witnessed remarkable progress in participation in education. Enrolment of children in primary education is at present nearly universal. The gender gap has narrowed, and in some regions girls tend to perform better in school than boys and progress in a more timely manner. However, in some developing countries that have not reached gender parity, the disparities against girls are stark. Today, 58 million children of primary school age are out of school worldwide. More than half of these are girls and nearly three quarters live in sub-Saharan Africa and Southern Asia. Secondary school enrolment has increased but remains lower than primary school enrolment. Although gender disparities in access to secondary education have been reduced, they remain wider and more prevalent than at the primary level—to the advantage of boys in some countries and of girls in others. Gender disparities are even broader at the tertiary level. Female participation in tertiary education overall has increased globally and currently surpasses male participation in almost all developed countries and in half of developing countries. However, women are clearly underrepresented in fields related to science, engineering, manufacturing and construction. Women are also underrepresented in the more advanced degree programmes, especially in science-related fields, resulting in fewer women than men in research. Women account for 30 per cent of all researchers—an increase compared to previous decades but still far from parity. Progress in educational access has yielded improvements in adult literacy and educational attainment. Illiteracy among youths has been eradicated in many regions of the world, and the vast majority of young women and men presently have basic reading and writing skills. However, an estimated 781 million people aged 15 and over remain illiterate. Nearly two thirds of them are women, a proportion that has remained unchanged for two decades. 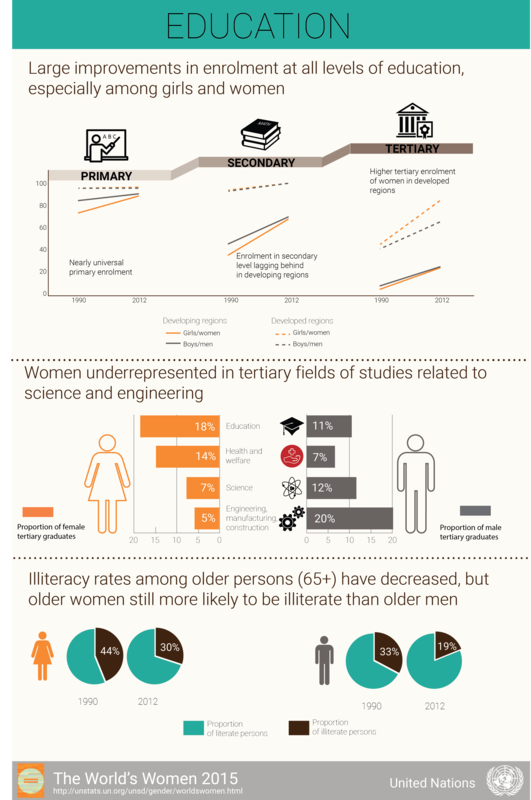 Illiteracy rates are highest among older people and are higher among women than men. At age 65 and over, 30 per cent of women and 19 per cent of men are illiterate. The vast majority of older persons are illiterate in Northern Africa, sub-Saharan Africa and Southern Asia, where gender gaps are also noted. As societies experience population ageing, it becomes increasingly important that literacy and other lifelong learning programmes enable women and men to become more self-reliant, work as long as desired and remain socially engaged at older ages. The World's Women 2015: Trends and Statistics by United Nations Statistics Division is licensed under a Creative Commons Attribution-NonCommercial 4.0 International License.